Rising temperatures are leading to increased demand for water and energy. In parts of the region, this will constrain development, stress natural resources, and increase competition for water. New agricultural practices will be needed to cope with changing conditions. Explore how climate change is affecting the Great Plains. The Great Plains is a diverse region where climate and water are woven into the fabric of life. Day-to-day, month-to-month, and year-to-year changes in the weather can be dramatic and challenging for communities and their commerce. The region experiences multiple climate and weather hazards, including floods, droughts, severe storms, tornadoes, hurricanes, and winter storms. In much of the Great Plains, too little precipitation falls to replace that needed by humans, plants, and animals. These variable conditions in the Great Plains already stress communities and cause billions of dollars in damage; climate change will add to both stress and costs. The people of the Great Plains historically have adapted to this challenging climate. Although projections suggest more frequent and more intense droughts, severe rainfall events, and heat waves, communities and individuals can reduce vulnerabilities through the use of new technologies, community-driven policies, and the judicious use of resources. Adaptation (means of coping with changed conditions) and mitigation (reducing emissions of heat-trapping gases to reduce the speed and amount of climate change) choices can be locally driven, cost effective, and beneficial for local economies and ecosystem services. Significant climate-related challenges are expected to involve 1) resolving increasing competition among land, water, and energy resources; 2) developing and maintaining sustainable agricultural systems; 3) conserving vibrant and diverse ecological systems; and 4) enhancing the resilience of the region’s people to the impacts of climate extremes. These growing challenges will unfold against a changing backdrop that includes a growing urban population and declining rural population, new economic factors that drive incentives for crop and energy production, advances in technology, and shifting policies such as those related to farm and energy subsidies. The Great Plains region features relatively flat plains that increase in elevation from sea level to more than 5,000 feet at the base of mountain ranges along the Continental Divide. Forested mountains cover western Montana and Wyoming, extensive rangelands spread throughout the Plains, marshes extend along Texas’ Gulf Coast, and desert landscapes distinguish far west Texas.43 A highly diverse climate results from the region’s large north-south extent and change of elevation. This regional diversity also means that climate change impacts will vary across the region. Great Plains residents already must contend with weather challenges from winter storms, extreme heat and cold, severe thunderstorms, drought, and flood-producing rainfall. Texas’ Gulf Coast averages about three tropical storms or hurricanes every four years,88 generating coastal storm surge and sometimes bringing heavy rainfall and damaging winds hundreds of miles inland. The expected rise in sea level will result in the potential for greater damage from storm surge along the Gulf Coast of Texas (see Ch. 25: Coasts). The region has a distinct north-south gradient in average temperature patterns, with a hotter south and colder north (Figure 19.1). Average annual precipitation greater than 50 inches supports lush vegetation in eastern Texas and Oklahoma. For most places, however, average rainfall is less than 30 inches, with some of Montana, Wyoming, and far west Texas receiving less than 15 inches a year. Across much of the region, annual water loss from transpiration by plants and from evaporation is higher than annual precipitation, making these areas particularly susceptible to droughts. Figure 19.2: The number of days with the hottest temperatures is projected to increase dramatically. The historical (1971-2000) distribution of temperature for the hottest 2% of days (about seven days each year) echoes the distinct north-south gradient in average temperatures. However, by mid-century (2041-2070), the projected change in number of days exceeding those hottest temperatures is greatest in the western areas and Gulf Coast for both the lower emissions scenario (B1) and for the higher emissions scenario (A2). (Figure source: NOAA NCDC / CICS-NC). Figure 19.5: Current regional trends of a drier south and a wetter north are projected to become more pronounced by mid-century (2041-2070 as compared to 1971-2000 averages). Maps show the maximum annual number of consecutive days in which limited (less than 0.01 inches) precipitation was recorded on average from 1971 to 2000 (top), projected changes in the number of consecutive dry days assuming substantial reductions in emissions (B1), and projected changes if emissions continue to rise (A2). The southeastern Great Plains, which is the wettest portion of the region, is projected to experience large increases in the number of consecutive dry days. (Figure source: NOAA NCDC / CICS-NC). Rising temperatures are leading to increased demand for water and energy. In parts of the region, this will constrain development, stress natural resources, and increase competition for water among communities, agriculture, energy production, and ecological needs. A central component of the assessment process was the Great Plains Regional Climate assessment workshop that was held in August 2011 in Denver, CO, with approximately 40 attendees. The workshop began the process leading to a foundational Technical Input Report (TIR), the Great Plains Regional Climate Assessment Technical Report.2 The TIR consists of 18 chapters assembled by 37 authors representing a wide range of inputs including governmental agencies, non-governmental organizations, tribes, and other entities. The chapter author team engaged in multiple technical discussions via regular teleconferences. These included careful review of the foundational TIR9 and of approximately 50 additional technical inputs provided by the public, as well as the other published literature, and professional judgment. These discussions were followed by expert deliberation of draft key messages by the authors during an in-person meeting in Kansas City in April 2012, wherein each message was defended before the entire author team prior to the key message being selected for inclusion in the report. These discussions were supported by targeted consultation with additional experts by the lead author of each message, and they were based on criteria that help define “key vulnerabilities”. The key message and supporting text summarizes extensive evidence documented in the Technical Input Report.2 Technical inputs (47) on a wide range of topics were also received and reviewed as part of the Federal Register Notice solicitation for public input. Temperatures are rising across the United States (Ch. 2: Our Changing Climate, Key Message 3 and its Traceable Account). Specific details for the Great Plains are provided in the Regional Climate Trends and Scenarios for the U.S. National Climate Assessment1 with its references. Rising temperatures impact energy and water (Ch.10: Energy, Water, and Land; Ch. 4: Energy). Publications have explored the projected increase in water competition and stress for natural resources3,4,5,6,7,8 and the fragmentation of natural habitats and agricultural lands.9 These sources provided numerous references that were drawn from to lead to this key message. A key uncertainty is the exact rate and magnitude of the projected changes in precipitation, because high inter-annual variability may either obscure or highlight the long-term trends over the next few years. Also unknown is ecological demand for water. Water use by native and invasive species under current climate needs to be quantified so that it can be modeled under future scenarios to map out potential impact envelopes. There is also uncertainty over the projections of changes in precipitation due to difficulty of modeling projections of convective precipitation, which is the primary source of water for most of the Great Plains. Very High for all aspects of the key message. The relationship between increased temperatures and higher evapotranspiration is well established. Model projections of higher temperatures are robust. Confidence is highest for the southern Great Plains, where competition among sectors, cities, and states for future supply is already readily apparent, and where population growth (demand-side) and projected increases in precipitation deficits are greatest. Energy, water, and land use are inherently interconnected,10 and climate change is creating a new set of challenges for these critical sectors (Ch. 2: Our Changing Climate; Ch. 10: Energy, Water, and Land).3,4,9,11 The Great Plains is rich with energy resources, primarily from coal, oil, and natural gas, with growing wind and biofuel industries.12,13 Texas produces 16% of U.S. energy (mostly from crude oil and natural gas), and Wyoming provides an additional 14% (mostly from coal). North Dakota is the second largest producer of oil in the Great Plains, behind Texas. Nebraska and South Dakota rank third and fifth in biofuel production, and five of the eight Great Plains states have more than 1,000 megawatts of installed wind generation capacity, with Texas topping the list.14 More than 80% of the region’s land area is used for agriculture, primarily cropland, pastures, and rangeland. Other land uses include forests, urban and rural development, transportation, conservation, and industry. Changing extremes in precipitation are projected across all seasons, including higher likelihoods of both increasing heavy rain and snow events1 and more intense droughts (Ch. 2: Our Changing Climate, Key Messages 5 and 6).17 Winter and spring precipitation and very heavy precipitation events are both projected to increase in the northern portions of the area, leading to increased runoff and flooding that will reduce water quality and erode soils. Increased snowfall, rapid spring warming, and intense rainfall can combine to produce devastating floods, as is already common along the Red River of the North. More intense rains will also contribute to urban flooding. Increased drought frequency and intensity can turn marginal lands into deserts. Reduced per capita water storage will continue to increase vulnerability to water shortages.8 Federal and state legal requirements mandating water allocations for ecosystems and endangered species add further competition for water resources. Diminishing water supplies and rapid population growth are critical issues in Texas. Because reservoirs are limited and have high evaporation rates, San Antonio has turned to the Edwards Aquifer as a major source of groundwater storage. Nineteen water districts joined to form a Regional Water Alliance for sustainable water development through 2060. The alliance creates a competitive market for buying and selling water rights and simplifies transfer of water rights. The key message and supporting text summarize extensive evidence documented in the Great Plains Technical Input Report.2 Technical inputs (47) on a wide range of topics were also received and reviewed as part of the Federal Register Notice solicitation for public input. Evidence for altered precipitation across the U.S. is discussed in Ch. 2: Our Changing Climate, Key Message 5 and 6 and their Traceable Accounts. Specific details for the Great Plains, such as warming winters and altered rainfall events are in the Climate Trends and Scenarios for the U.S. National Climate Assessment1 with its references. A key issue (uncertainty) is rainfall patterns. Although models show a general increase in the northern Great Plains and a decrease in the southern Great Plains, the diffuse gradient between the two leaves uncertain the location of greatest impacts on the hydrologic cycle. Timing of precipitation is critical to crop planting, development and harvesting; shifts in seasonality of precipitation therefore need to be quantified. Rainfall patterns will similarly affect forage production, particularly winter wheat that is essential to cattle production in the southern Great Plains. The general pattern of precipitation changes and overall increases in temperature are robust. The implications of these changes are enormous, although assessing changes in more specific locations is more uncertain. Our assessment is based on the climate projections and known relationships to crops (for example, corn not being able to “rest” at night due to high minimum temperatures), but pinpointing where these impacts will occur is difficult. Additionally, other factors that influence productivity, such as genetics, technological change, economic incentives, and federal and state policies, can alter or accelerate the impacts. Given the evidence and remaining uncertainties, agriculture and livestock management practices will need to adjust to these changes in climate and derived aspects although specific changes are yet to be determined. Overall, confidence is high. The important agricultural sector in the Great Plains, with a total market value of about $92 billion (the most important being crops at 43% and livestock at 46%),23 already contends with significant climate variability (Ch. 6: Agriculture). Projected changes in climate, and human responses to it, will affect aspects of the region’s agriculture, from the many crops that rely solely on rainfall, to the water and land required for increased energy production from plants, such as fuels made from corn or switchgrass (see Ch. 10: Energy, Water, and Land). Projected changes in precipitation and temperature have both positive and negative consequences to agricultural productivity in the Northern Plains. Projected increases in winter and spring precipitation in the Northern Plains will benefit agricultural productivity by increasing water availability through soil moisture reserves during the early growing season, but this can be offset by fields too wet to plant. Rising temperatures will lengthen the growing season, possibly allowing a second annual crop in some places and some years. Warmer winters pose challenges.26,27,28 For example, some pests and invasive weeds will be able to survive the warmer winters.29,30 Winter crops that leave dormancy earlier are susceptible to spring freezes.31 Rainfall events already have become more intense,32 increasing erosion and nutrient runoff, and projections are that the frequency and severity of these heavy rainfall events will increase.1,33 The Northern Plains will remain vulnerable to periodic drought because much of the projected increase in precipitation is expected to occur in the cooler months while increasing temperatures will result in additional evapotranspiration. In the Central and Southern Plains, projected declines in precipitation in the south and greater evaporation everywhere due to higher temperatures will increase irrigation demand and exacerbate current stresses on agricultural productivity. Increased water withdrawals from the Ogallala Aquifer and High Plains Aquifer would accelerate ongoing depletion in the southern parts of the aquifers and limit the ability to irrigate.18,34 Holding other aspects of production constant, the climate impacts of shifting from irrigated to dryland agriculture would reduce crop yields by about a factor of two.19 Under these climate-induced changes, adaptation of agricultural practices will be needed, however, there may be constraints on social-ecological adaptive capacity to make these adjustments (see also Ch. 28: Adaptation). The projected increase in high temperature extremes and heat waves will negatively affect livestock and concentrated animal feeding operations.20,21 Shortened dormancy periods for winter wheat will lessen an important source of feed for the livestock industry. Climate change may thus result in a northward shift of crop and livestock production in the region. In areas projected to be hotter and drier in the future, maintaining agriculture on marginal lands may become too costly. Figure 19.6: Irrigation in western Kansas, Oklahoma, and Texas supports crop development in semiarid areas. Declining aquifer levels threaten the ability to maintain production. 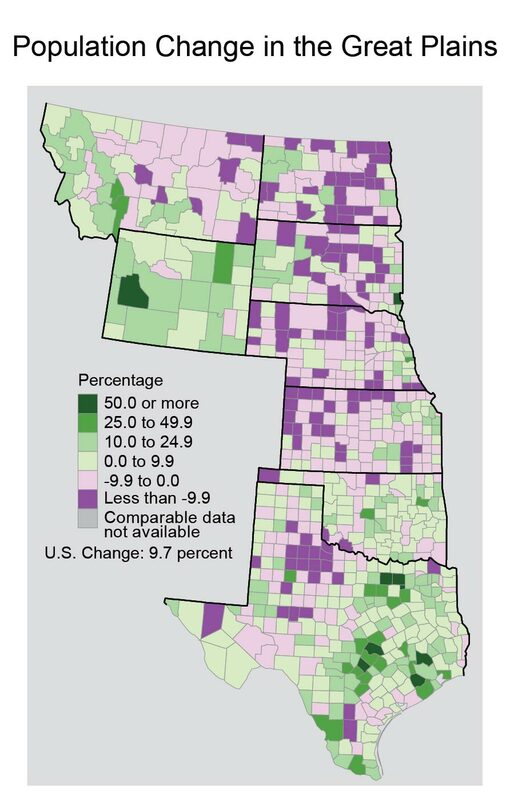 Some aquifer-dependent regions, like southeastern Nebraska, have seen steep rises in irrigated farmland, from around 5% to more than 40%, during the period shown. (Figure source: reproduced from Atlas of the Great Plains by Stephen J. Lavin, Clark J. Archer, and Fred M. Shelley by permission of the University of Nebraska. Copyright 2011 by the Board of Regents of the University of Nebraska22). During the droughts of 2011 and 2012, ranchers liquidated large herds due to lack of food and water. Many cattle were sold to slaughterhouses; others were relocated to other pastures through sale or lease. As herds are being rebuilt, there is an opportunity to improve genetic stock, as those least adapted to the drought conditions were the first to be sold or relocated. Some ranchers also used the drought as an opportunity to diversify their portfolio, managing herds in both Texas and Montana. Landscape fragmentation is increasing, for example, in the context of energy development activities in the northern Great Plains. A highly fragmented landscape will hinder adaptation of species when climate change alters habitat composition and timing of plant development cycles. In general, the anticipated carbon dioxide enrichment, warming, and increase in precipitation variability influence vegetation primarily by affecting soil-water availability to plants. 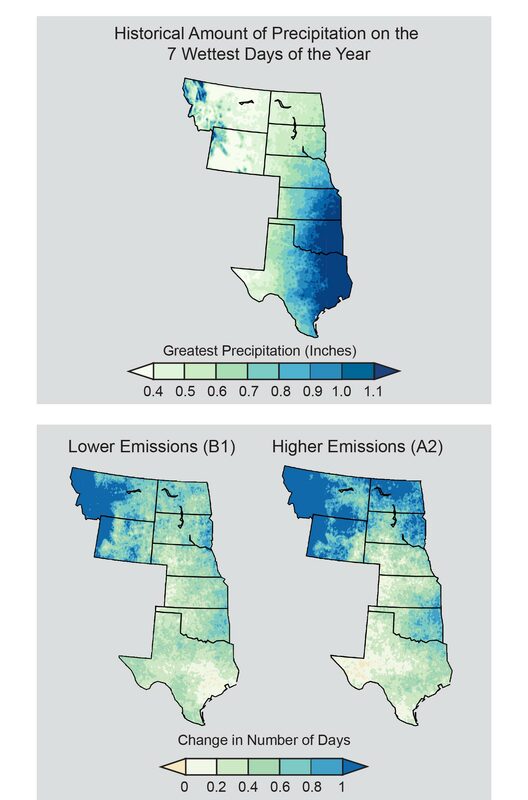 This is especially important as the transition between water surplus and water deficit (based on precipitation minus evapotranspiration) occurs across the Great Plains, with eastern areas supporting more biomass than western areas, especially given the current east-to-west difference in precipitation and the vegetation it supports.43 These effects are evident in experiments with each of the individual aspects of climate change.44 It is difficult to project, however, all of the interactions with all of the vegetative species of the Great Plains, so as to better manage ecosystems. Confidence is very high that landscape is already fragmented and will continue to become more fragmented as energy exploration expands into less suitable agriculture lands that have not been developed as extensively. The effects of carbon dioxide and water availability on individual species are well known, but there is less published research on the interaction among different species. Evidence for the impact of climate change on species is very high, but specific adaptation strategies used by these species are less certain. Because of the more limited knowledge on adaptation strategies, we rate this key message overall has having high confidence. Our assessment is based upon historical methods, such as migration, used by species across the Great Plains to adapt to previous changes in climate and habitats and the incompatibility of those methods with current land-use practices. Land development for energy production, land transformations on the fringes of urban areas, and economic pressures to remove lands from conservation easements pose threats to natural systems in the Great Plains.47 Habitat fragmentation is already a serious issue that inhibits the ability of species to migrate as climate variability and change alter local habitats.48,49 Lands that remain out of production are susceptible to invasion from non-native plant species. Many plant and animal species are responding to rising temperatures by adjusting their ranges at increasingly greater rates.38,39 These adjustments may also require movement of species that have evolved to live in very specific habitats, which may prove increasingly difficult for these species. The historic bison herds migrated to adapt to climate, disturbance, and associated habitat variability,50 but modern land-use patterns, roads, agriculture, and structures inhibit similar large-scale migration.40,41 In the playa regions of the southern Great Plains, agricultural practices have modified more than 70% of seasonal lakes larger than 10 acres, and these lakes will be further altered under warming conditions.36,51 These changes in seasonal lakes will further affect bird populations52 and fish populations53,54 in the region. Observed climate-induced changes have been linked to changing timing of flowering, increases in wildfire activity and pest outbreaks, shifts in species distributions, declines in the abundance of native species, and the spread of invasive species (Ch 8: Ecosystems). From Texas to Montana, altered flowering patterns due to more frost-free days have increased the length of pollen season for ragweed by as many as 16 days over the period from 1995 to 2009.37 Earlier snowmelt in Wyoming from 1961 to 2002 has been related to the American pipit songbird laying eggs about 5 days earlier.42 During the past 70 years, observations indicate that winter wheat is flowering 6 to 10 days earlier as spring temperatures have risen.27 Some species may be less sensitive to changes in temperature and precipitation, causing first flowering dates to change for some species but not for others.26 Even small shifts in timing, however, can disrupt the integrated balance of ecosystem functions like predator-prey relationships, mating behavior, or food availability for migrating birds. In addition to climate changes, the increase in atmospheric CO2 concentrations may offset the drying effects from warming by considerable improvements in plant water-use efficiency, which occur as CO2 concentrations increase.44 However, nutrient content of the grassland communities may be decreased under enriched CO2 environments, affecting nutritional quality of the grasses and leaves eaten by animals. The interaction of climate and land-use changes across the Great Plains promises to be challenging and contentious. Opportunities for conservation of native grasslands, including species and processes, depend primarily and most immediately on managing a fragmented network of untilled prairie. 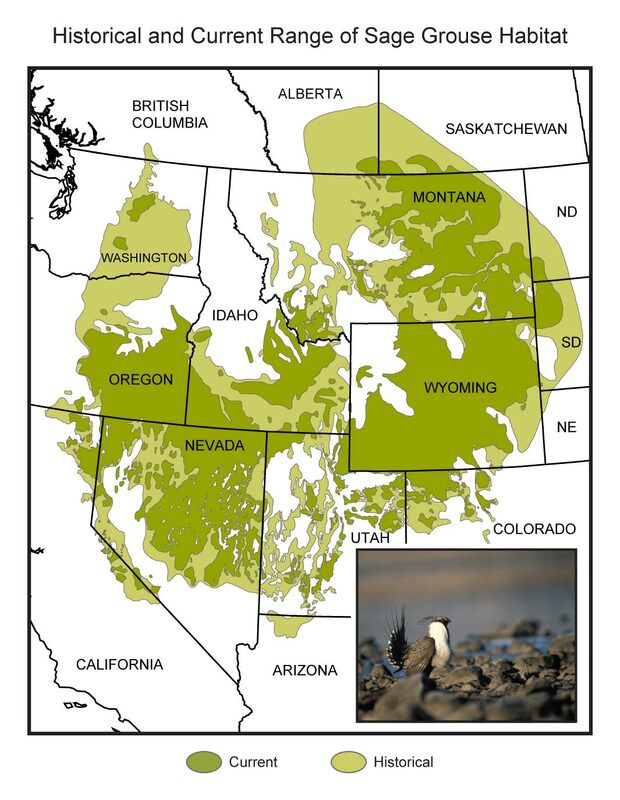 Restoration of natural processes, conservation of remnant species and habitats, and consolidation/connection of fragmented areas will facilitate conservation of species and ecosystem services across the Great Plains. However, climate change will complicate current conservation efforts as land fragmentation continues to reduce habitat connectivity. The implementation of adaptive management approaches provides robust options for multiple solutions. The key message and supporting text summarize extensive evidence documented in the Technical Input Report.2 Technical inputs (47) on a wide range of topics were also received and reviewed as part of the Federal Register Notice solicitation for public input. A key issue (uncertainty) is how limited financial resources will be dedicated to adaptation actions and the amount of will and attention that will be paid to decreasing vulnerability and increasing resilience throughout the region. Should the awareness of damage grow great enough, it may overcome the economic incentives for development and change perspectives, allowing for increased adaptive response. But if current trends continue, more vulnerable lands may be lost. Thus the outcome on rural and vulnerable populations is largely unknown. Extensive literature exists on vulnerable populations, limited resources and ability to respond to change. However, because the expected magnitude of changes is beyond previous experience and societal response is unknown, so the overall confidence is high. The Great Plains is home to a geographically, economically, and culturally diverse population. For rural and tribal communities, their remote locations, sparse development, limited local services, and language barriers present greater challenges in responding to climate extremes. Working-age people are moving to urban areas, leaving a growing percentage of elderly people in rural communities (see also Ch. 14: Rural Communities). 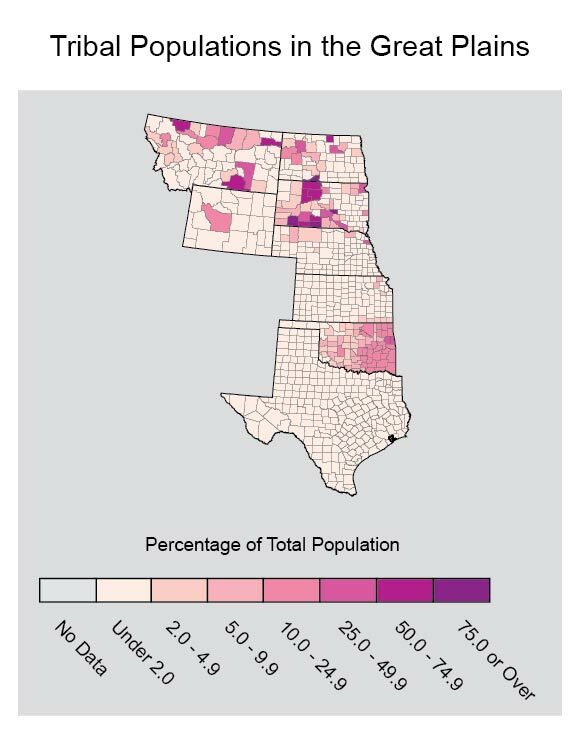 Overall population throughout the region is stable or declining, with the exception of substantial increases in urban Texas, tribal communities, and western North Dakota, related in large part to rapid expansion of energy development.67 Growing urban areas require more water, expand into forests and cropland, fragment habitat, and are at a greater risk of wildfire – all factors that interplay with climate. No clear catalog of ongoing adaptation activities exists for the Great Plains region. Initial steps towards such a catalog have been supported by the National Climate Assessment in association with NOAA’s Regional Integrated Sciences and Assessments teams. The short-term nature of many planning activities has been described.81 Until a systematic assessment is conducted, most examples of adaptation are anecdotal. However, stresses in physical and social systems are readily apparent, as described in the other key messages. How communities, economic sectors, and social groups will respond to these stresses needs further study. Climate trends over the past century, such as North Dakota warming more than any other state in the contiguous U.S., coupled with evidence of ecological changes and projections for further warming indicates very high confidence that climate patterns will be substantially different than those of the preceding century. While systematic evidence is currently lacking, emerging studies point toward a proclivity toward short-term planning and incremental adjustment rather than long-term strategies for evolving agricultural production systems, habitat management, water resources and societal changes. Evidence suggests that adaptation is ad hoc and isolated and will likely be inadequate to address the magnitude of social, economic, and environmental challenges that face the region. Overall confidence is medium. The Great Plains is an integrated system. Changes in one part, whether driven by climate or by human decisions, affect other parts. Some of these changes are already underway, and many pieces of independent evidence project that ongoing climate-related changes will ripple throughout the region. Many of these challenges will cut across sectors: water, land use, agriculture, energy, conservation, and livelihoods. Competition for water resources will increase within already-stressed human and ecological systems, particularly in the Southern Plains, affecting crops, energy production, and how well people, animals, and plants can thrive. The region’s ecosystems, economies, and communities will be further strained by increasing intensity and frequency of floods, droughts, and heat waves that will penetrate into the lives and livelihoods of Great Plains residents. Although some communities and states have made efforts to plan for these projected changes, the magnitude of the adaptation and planning efforts do not match the magnitude of the expected changes. Communities already face tradeoffs in efforts to make efficient and sustainable use of their resources. Jobs, infrastructure, and tax dollars that come with fossil fuel extraction or renewable energy production are important, especially for rural communities. There is also economic value in the conversion of native grasslands to agriculture. Yet the tradeoffs among this development, the increased pressure on water resources, and the effects on conservation need to be considered if the region is to develop climate-resilient communities. Untilled prairies used for livestock grazing provide excellent targets for native grassland conservation. Partnerships among many different tribal, federal, state, local, and private landowners can decrease landscape fragmentation and help manage the connection between agriculture and native habitats. Soil and wetland restoration enhances soil stability and health, water conservation, aquifer recharge, and food sources for wildlife and cattle. Healthy species and ecosystem services support social and economic systems where local products, tourism, and culturally significant species accompany large-scale agriculture, industry, and international trade as fundamental components of society. 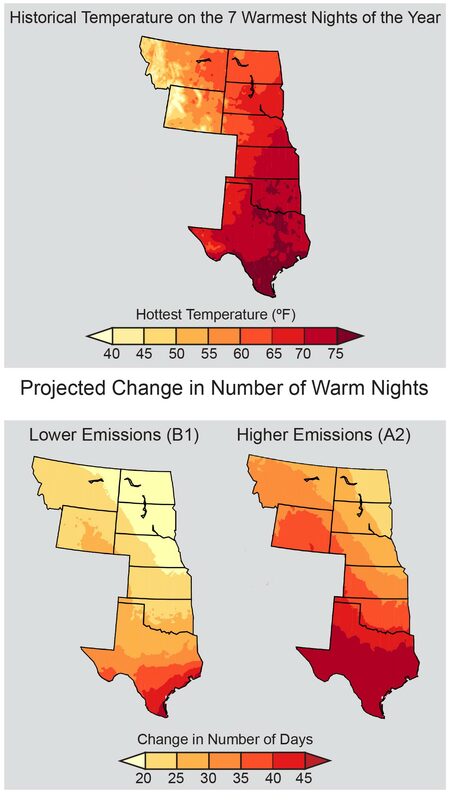 Although there is tremendous adaptive potential among the diverse communities of the Great Plains, many local government officials do not yet recognize climate change as a problem that requires proactive planning.83,81 Positive steps toward greater community resilience have been achieved through local and regional collaboration and increased two-way communication between scientists and local decision-makers (see Ch. 28: Adaptation). For example, the Institute for Sustainable Communities conducts Climate Leadership Academies that promote peer learning and provides direct technical assistance to communities in a five-state region in the Southwest as part of their support of the Western Adaptation Alliance.84 Other regions have collaborated to share information, like the Southeast Florida Regional Compact 2012. Programs such as NOAA’s Regional Integrated Sciences and Assessments (RISA) support scientists working directly with communities to help build capacity to prepare for and adapt to both climate variability and climate change.85 Climate-related challenges can be addressed with creative local engagement and prudent use of community assets.86 These assets include social networks, social capital, indigenous and local knowledge, and informal institutions. 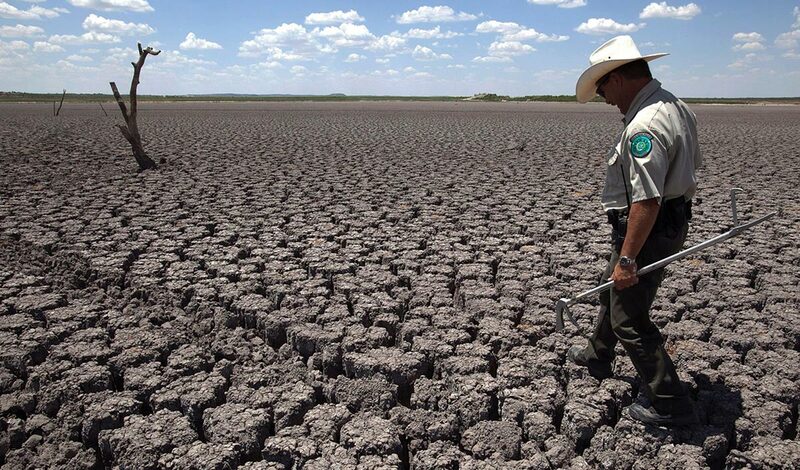 A Texas State Park police officer walks across a cracked lakebed in August 2011. This lake once spanned more than 5,400 acres. 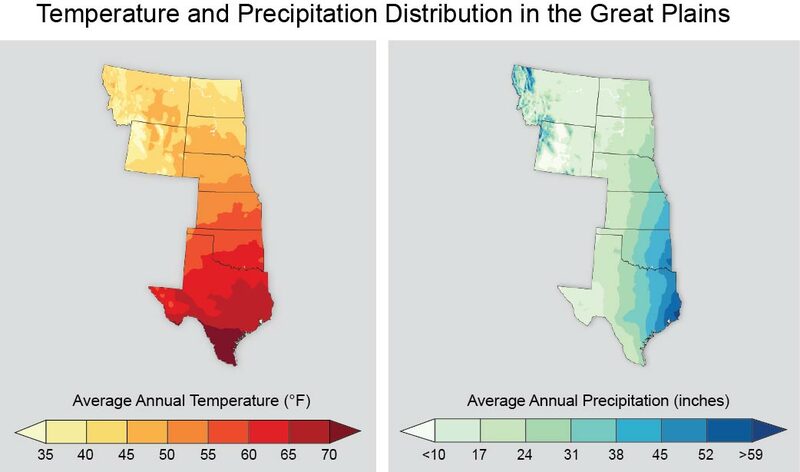 Future climate change projections include more precipitation in the northern Great Plains and less in the southern Great Plains. In 2011, such a pattern was strongly manifest, with exceptional drought and recording-setting temperatures in Texas and Oklahoma and flooding in the northern Great Plains. 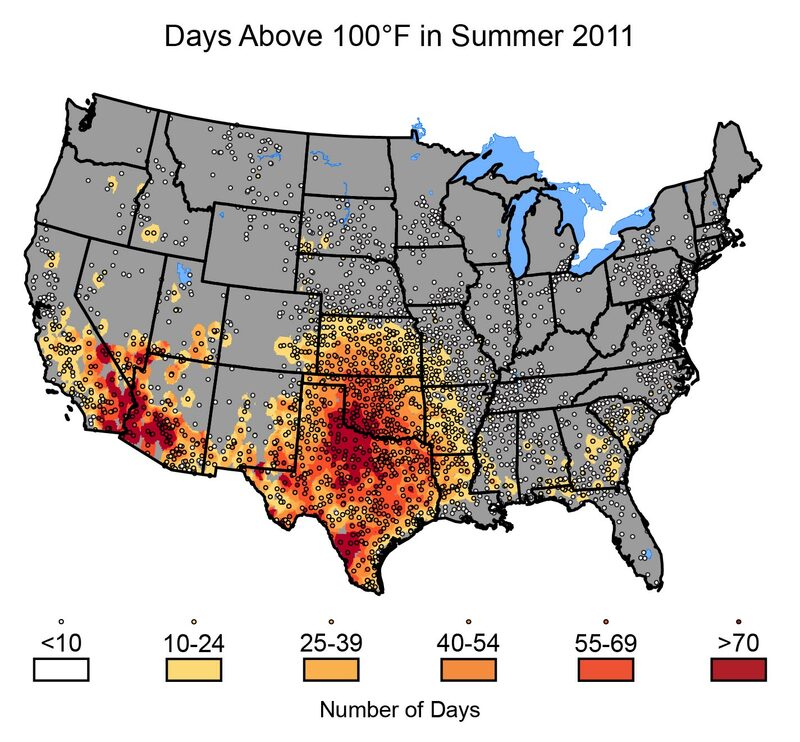 Many locations in Texas and Oklahoma experienced more than 100 days over 100ºF. Both states set new records for the hottest summer since record keeping began in 1895. Rates of water loss due in part to evaporation were double the long-term average. The heat and drought depleted water resources and contributed to more than $10 billion in direct losses to agriculture alone. These severe water constraints strained the ability to meet electricity demands in Texas during 2011 and into 2012, a problem exacerbated by the fact that Texas is nearly isolated from the national electricity grid. Increases in heavy downpours contribute to flooding. These recent temperature extremes were attributable in part to human-induced climate change (approximately 20% of the heat wave magnitude and a doubling of the chance that it would occur).87 In the future, average temperatures in this region are expected to increase and will continue to contribute to the intensity of heat waves (Ch. 2: Our Changing Climate, Key Messages 3 and 7). By contrast to the drought in the Southern Plains, the Northern Plains were exceptionally wet in 2011, with Montana and Wyoming recording all-time wettest springs and the Dakotas and Nebraska not far behind. Record rainfall and snowmelt combined to push the Missouri River and its tributaries beyond their banks and leave much of the Crow Reservation in Montana underwater. The Souris River near Minot, North Dakota, crested at four feet above its previous record, with a flow five times greater than any in the past 30 years. 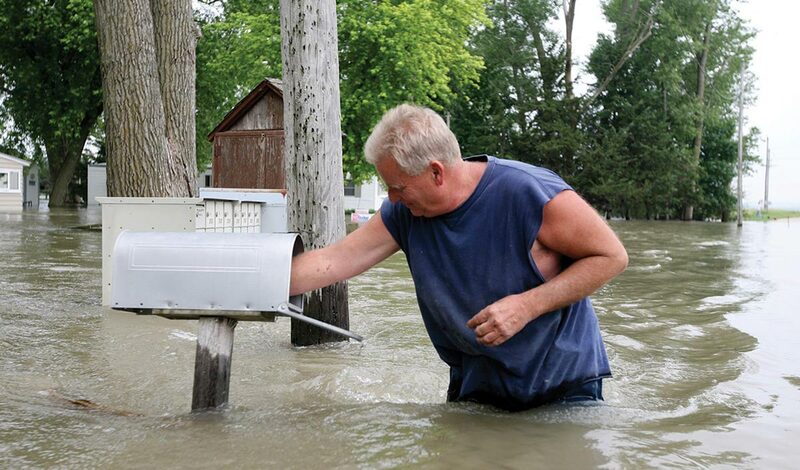 Losses from the flooding were estimated at $2 billion.